In English, there are two grammatical terms, that forms part of a sentence which may or may not be meaningful. These are phrase and clause, wherein the phrase implies a set of words, that acts as a single unit but does not have a subject and predicate. She lives in Gujarat, since 2012. I went to my home, after returning from the party, last night. In the first sentence, in Gujarat is just a phrase, as it does not have a subject-verb pairing, while she lives in Gujarat is a clause, as it contains both subject and verb. In the next sentence, I went to my home, is a clause because it has a subject and a verb, whereas to my home and from the party, are the phrases, as it is just a group of words, not making any sense. Meaning A phrase is a set of words, taken together in the form of a conceptual unit. 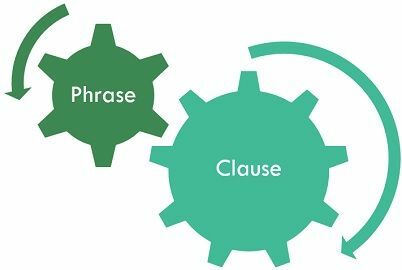 A clause is a component of grammatical arrangement, that contains set of words having a subject and verb. Example I will see you at the court. The one who met you at Mc Donald's, is my neighbor. Harry loves to travel alone. You can play, after watching TV. A phrase refers to a combination of two or more words, that are related to one another and acts as a single unit, but does not contain a subject-verb pairing. It forms a part of a clause or sentence which is used to provide further information. Noun Phrase: E.g. The lady at the store is my mother. Verb Phrase: E.g. She must be singing, at the interschool talent hunt. Adverbial Phrase: E.g. Anirudh told me the truth very honestly. Gerund Phrase: E.g. Vaanya and her friends enjoyed a lot, dancing at the party. Infinitive Phrase: E.g. Tarun likes to surprise others. Prepositional Phrase: E.g. You can find the food on the table. In the above examples, you might have observed, there are nouns and verbs too, but in no case, the nouns act as the subject of the sentence, doing a predicate verb. When in a set of words, there is a subject actively performing an action (verb), then that combination of words, is called as a clause. A clause can function as a sentence, which may or may not be a complete one. Adverbial clause: E.g. After the party was over, the band left for Mumbai, for the next concert. Adjective (relative) clause: E.g. The child, who gave you chocolate yesterday, is my niece. Independent (main) clause: E.g. Jane talks slowly, at the library. Dependent (subordinate) clause: E.g. I had food before I left for the office. Noun clause: E.g. I know what she is trying to hide. A phrase is described as a group of two or more than two words related to one another, that constitute a single unit. On the other extreme, the clause is a part of a sentence, that contains a subject (noun phrase) that actively performs an action (finite verb form). A phrase is a part of a clause or a sentence. As against, a clause is a sentence fragment. A clause has a subject and predicate, whereas a phrase doesn’t. A phrase cannot standalone, as it does not convey a meaning. In contrast, a clause is a standalone statement, which conveys a thought or idea. She lives near my friend’s home. I was waiting, outside the hostel. This is my last attempt for IAS examination. She understands what you cannot explain in words. You can easily find out, which set of words is a phrase or clause, by dividing them into various parts of speech. If the combination of words contains a subject and a verb, then it is regarded as a clause, otherwise, it is called as a phrase. Thanks, this certainly cleared up the difference between clause and phrase for me. Thanks for clarifying the differences! Thx for the clarification… I have a test on this and didn’t even understand it that well from the teacher, but this is a life saver, Truly, I would have never understood the differences between phrases and clauses and the types of phrases and clauses.